First off, I’m not the world’s biggest fan of The Beatles. In all honesty, I’m not really a fan at all. Prior to the release of The Beatles: Rock Band, there wasn’t an album by the The Beatles to be found in my iTunes library. But leading up to the release of this game, I found myself getting more and more excited about rocking out to some of the most well known songs in the history of pop music, and I was not let down. Or at least, not right away. The Beatles: Rock Band is oozing with style, and has been carefully crafted with all the love in the world. 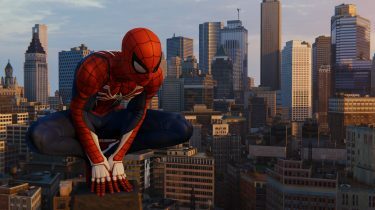 From the opening and outro cinematics, to the in-game movies that fill the screen as you play, to the gorgeous menu screens. This is likely the most polished game I’ve had the pleasure of experiencing. 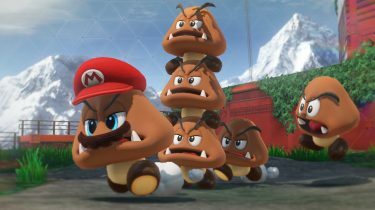 There haven’t been a whole lot of changes to the core gameplay since Rock Band 2 was released just a year ago. But a couple nice little details I did notice improved the experience for the better. One being the complete absence of drum fills. These have always driven me a little crazy, especially when dropped in a completely inappropriate place. The second being the count-in when you return from pausing the game. Typically, the second you hit “resume game”, your thrown back into the song and it’s nearly impossible to avoid missing notes. Where as in this version of Rock Band, it gives you a 3 second countdown before firing back up. The career mode is a bit of a unique experience in that there’s no massive world map, and no choice of what venue you’re going to play at, and in what order. You relive The Beatles’ career as it happened, hitting some of the most prominent events along the way. During each event, you play a small collection of songs from that time period and gather collectibles in the form of photographs along the way. There is only 45 songs in total, and the fact that there’s an Achievement for finishing the career in less than 24 hours is a testament to its short length. Early on, the game is a lot of fun. The old rock and roll songs are a blast on every instrument and it’s genuinely exciting to experience. Later on in their career when they started hitting the bongs, things tapered off dramatically. So much so, that I couldn’t bring myself to finish the final chapter after seeing the tracks I had to play. Even with an easy Achievement in sight, it just wasn’t enticing enough to sit through that mundane music. It’s interesting to see how Harmonix tried to offset the drab music and the fact that The Beatles spent their last few years in a studio and not on the road. The music and artwork inspired scenes that are shown during this era are definitely something to see. While they’re not the same calibre of the CG cinematics shown at the opening and outro of the game, they’re still very entertaining. As I mentioned earlier, you collect photographs during the career. At certain intervals, videos are rewarded and both types of collectibles are quite interesting. Not being a huge fan of the band, I didn’t think much of them initially. But one night I found myself sifting through the photos, reading every story that accompanied them, and I did so for the better part of an hour. The video footage is really amazing, since it’s more of a candid nature, so you see a different side of The Beatles than usual. 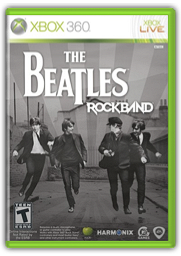 The Beatles: Rock Band is a definite must buy for any fan that enjoys this type of music game. 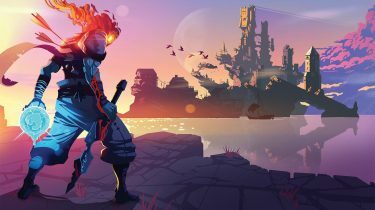 It’s also worth checking out if you’re at all familiar with the music and want to experience a music game that’s taken in a drastic new direction. 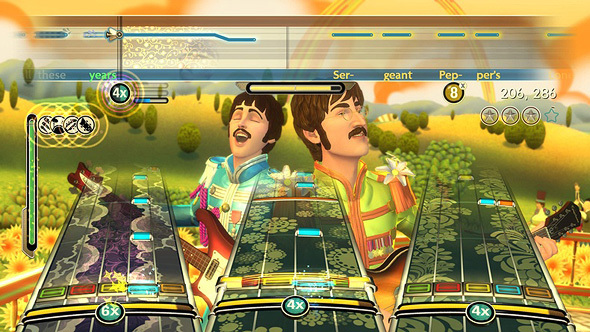 It really does carry a different vibe than previous versions of Rock Band and even Guitar Hero.